It's a slideshow, not a demo. yes ? well, the only thing i could get running in VICE was this picture. and it was in the demo compo... so i couldnt know. impressive hires stuff, i only wish it was more of a demo than a slideshow. also, i'd appreciate original pictures more than copies from photos. 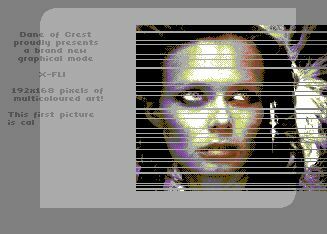 The new resolution (XFLI) is brutal (as are the pictures), the sideborder pic with samples in particular is a cool piece of code and generally the music and graphics are cool. it's all drawn, xfli indeed is new, so i don't see a reason to moan about it. dane did some great work there. I like the digi bits in here a lot, some more original art would have helped for me to like it even better, but it's a cool design production. Remember: Not all demos have to have fast switching effects in bad resolution. Watch this on the real thing, the graphic looses a lot in the emulation (and so does music). Looking forward to more future Crest productions. This was a month and a half's worth workof code and two years worth of pixeling. Hopefully I can spend some more time coding on the sequel, though a little birdie whispered in my ear most of the routines in this demo were never done before. :) Glad you like it! a new gfx mode? wow... THAT's impressive! the pictures really rock too. two well-spent years, dane. hm, can you explain the difference between XFLI and Super Hires? Dane did it, i love it. Wow! there are still secret dungeons in my beloved C64. Great. rulez added on the 2010-10-16 19:25:10 by w00t! page created in 0.014083 seconds with 15 queries.